I'm not sending a kid out the door with a backpack and a lunch box yet. This time of year, however, always makes me want to buy new school supplies and sharpen some pencils. I have always loved school! As a child, the school story was always my favorite fiction genre. I began with Richard Scarry's labeled depictions of classrooms. I branched into chapter books with Ramona the Pest's adventures in Kindergarten. And I continued the school story genre with titles like There's a Boy in the girl's bathroom. School has always been one of my favorite places, what can I say? 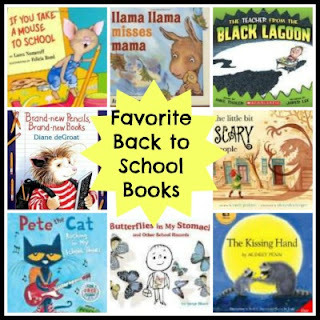 In honor of the teachers and students starting a fresh school year, I thought I'd share some of my favorite books about the beginning of the school year, starting with some that were special to me when I was teaching. The Kissing Hand - Chester the racoon is not convinced when his mother tells him that racoon school will be fun. But when his mother passes on a family secret- a kiss that he can hold in his hand to remember his mom- going to school seems a little bit easier. This is a great book for mom, too, be prepared to to shed a tear on your first read. You might not want to read with your child the first time through. The Teacher From the Black Lagoon by Mike Thaler.It's Hubie's first day of school and his imagination is running wild with the horrors of his homeroom teacher. This is a great pick for a kid who uses humor to deal with stressful situations. It was always a fun writing prompt for my fourth graders when I was teaching. There are a whole series of books to check out! If You Take a Mouse to School by Laura Numeroff. Following in the tradition of the If you Give a books by Laura Numeroff, this book focuses on taking a mouse to school. Kids will be able to see the areas of the classroom and supplies as well as laughing at the antics of a mouse in school. These are some current titles that I discovered through a variety of blogs or book review sites. I like all of these for the beginning of the school year. Butterflies in my Stomach and Other School Hazards I found this book at www.thebookmavenshaven.blogspot.com I put it on my library hold list and picked it up today. It is a great book for kids who are learning about the use of figurative language/idioms. It walks through a first day of school with a boy who is nervous about starting school. The book is told almost entirely in idioms. My favorite part is the ending. The bus driver said, "School was sometimes a tough nut to crack, but that every cloud has it's silver lining." And the boy said, "I had no idea what she meant by that." It makes me think of when I was teaching Title 1 reading and I picked up a little boy from his class and said, "What were you learning about?" And he said, "I have absolutely no idea!" Most kids just aren't that honest, are they? Llama Llama Misses Mama In this story, mama drops Llama off at school. Llama has to deal with her separation from Mama. It makes me want to break into Hap Palmer's "My mommy comes back, she always comes back, she always comes back to get me..."
Oh, and for fans of Llama, did you know there is a new book being released on August 23? Llama Llama Home with Mama about a sick day from school. We'll save this one for cold and flu season! Pete the Cat: Rocking in My School Shoes The last one on my list is one that I still need to check out. I loved Pete the Cat, so I think this new release, Pete the Cat: Rocking in My School Shoes looks fun. If you don't believe me, check out this book trailer from youtube. Cute, I say. Which back to school books should I add to my must-read pile? Also voted for If you Take a Mouse to School-- don't we all love Laura Numeroff. You can find some other titles I pinned from blogs I was reading on my Back to School with Books Pinterest board. What a fantastic selection of back-to-school books! Thanks for all the recommendations! I am impressed by the selection of books.I was looking for books as my daughter starts to school.Splendid!Thanks for linking up to Book Sharing Monday. This is a great list! I wrote several of the titles down and we'll look for them at the library next time we go. Thanks! Great book list, the little bit scary people looks interesting. Great list! I might pick up some of these books still. Thanks for joining WMCIR!